VIP tickets are sold out, but general admission is still available. Online tickets sales have closed, General Admission tickets are available at the door for $35. 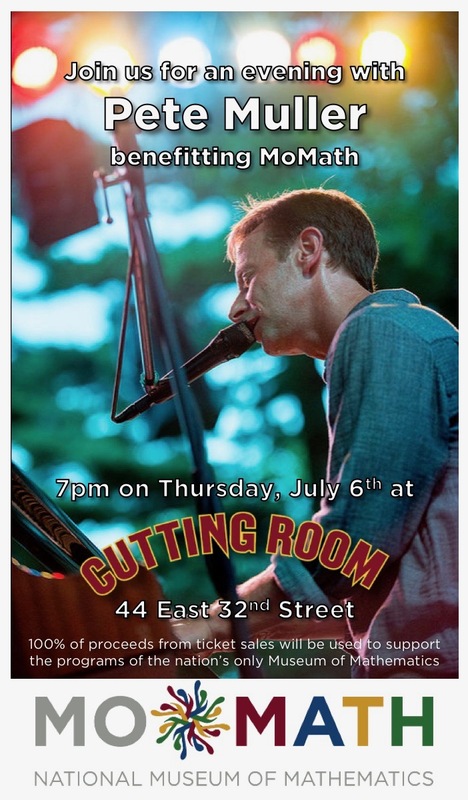 Join singer/songwriter Pete Muller in a special summer concert benefiting MoMath. Muller, a modern day Renaissance man, began his musical career by busking for the masses in the New York subways while at the same time publishing a monthly music-themed crossword puzzle and achieving success as a pioneer in quant investing, where he was dubbed one of the "hottest hedge fund manager[s] on Wall Street today." Muller’s budding musical career caught the attention of Forbes, The New York Times, and various other outlets, which led to three albums, the most recent produced by two-time Grammy winner Rick DePofi. With influences such as Billy Joel, Shawn Colvin, Patty Griffin, and Elvis Costello, Muller’s accessible lyrical style has garnered him hundreds of thousands of views on YouTube. The evening will also feature the creative talents of John “Whooli” Whoolilurie on sax/keyboard, Skip Ward on bass, David Silliman on drums, Katie Jacoby on violin, Timba Harris on violin/trumpet, and Missy Soltero on vocals. Plus, now featuring special guest performances by saxophonist Marcus Miller and jazz violinist Russell Farhang. 100% of the proceeds from ticket sales will be used to support the programs and operations of the nation’s only Museum of Mathematics.